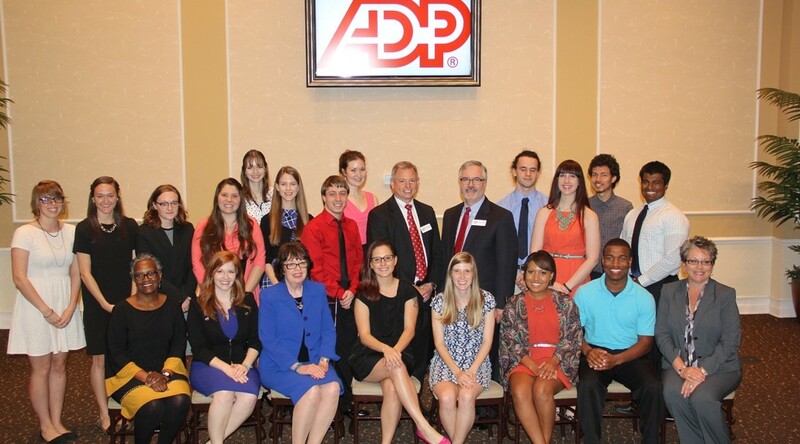 Automated Data Processing (ADP), an American provider of business outsourcing solutions, has named 29 students from Georgia Regents University to be among the company’s 2015 scholars. The scholarships are funded through a $700,500 three-year grant from ADP to Georgia Regents University, Paine College, and Augusta Technical College to enhance science education and to increase the number of graduates in science, technology, engineering, mathematics (STEM), and STEM-related fields. In addition to scholarships, ADP also provides funding support for tutorial centers to help GRU students excel in rigorous STEM disciplines. The Phoenix, GRU’s award-winning student-run magazine, recently added two more accolades, both from the Society of Professional Journalists. The Phoenix editorial staff – Editor-in-Chief Matthew Johnson, Assistant Editor Anna Garner, Creative Director Drew Greiner, and Business Manager Kaitlin Keller – was a finalist in the best magazine category, and Erica Ruggles won the Region 3 feature story category for “Hooked,” her first-person account of flesh suspension. As a regional winner, Ruggles’ story will go on to compete for best feature at the national level. While the subject matter – being suspended above the ground by a series of hooks pierced through the skin – might raise some eyebrows, the writing is eye opening. VanTuyll said all the students are communications majors who realize the advantages of being associated with a regularly published magazine as successful as the 21-year-old Phoenix. The Phoenix is published three times a year. The fall issue, which includes Ruggles’ story about suspension, is still available in print form and can also be found online here. 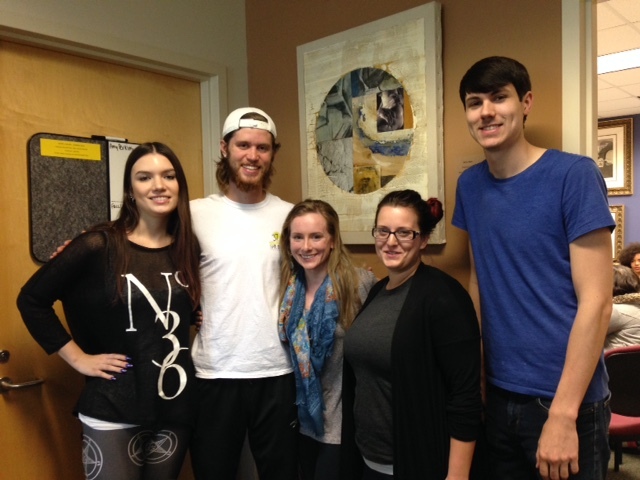 GRU drama students recently had starring roles in exam rooms. Physician assistant students are required to interview a ‘patient’ (typically a practicing PA or teaching assistant simulating the role) to obtain a medical history. Last semester, the drama students filled the roles. Associate Professor Kathy Dexter had heard about a similar set-up at another University System of Georgia campus and approached drama lecturer Doug Joiner, who jumped at the chance to give his students a chance to perform. Joiner earned his graduate degree from Virginia Commonwealth University, which had a similar program, so the prospect piqued his interest. For the interview, the drama student follows a script with a complaint and a series of responses to anticipated questions from the PA student. Dexter said the acting students made much more realistic patients because, unlike PAs, they were unfamiliar with medical terminology and didn’t know what the PA students were supposed to be asking. The interviews, typically 20 minutes, were recorded in a realistically appointed mock exam room. After the 44 PA students finished interviewing the 13 drama students (many of whom pulled double duty), both course instructors evaluated the videos to gauge their students’ performances. Assistant PA Professor Stevie Redmond said she felt the joint participation exemplified GRU’s ability to capitalize on its new interdisciplinary relationships. In January, Georgia Regents University’s James M. Hull College of Business Augusta Leading Economic Index (LEI) increased 0.2% from December. The index has increased 5.6% from January 2014. This represents eleven consecutive months of growth. 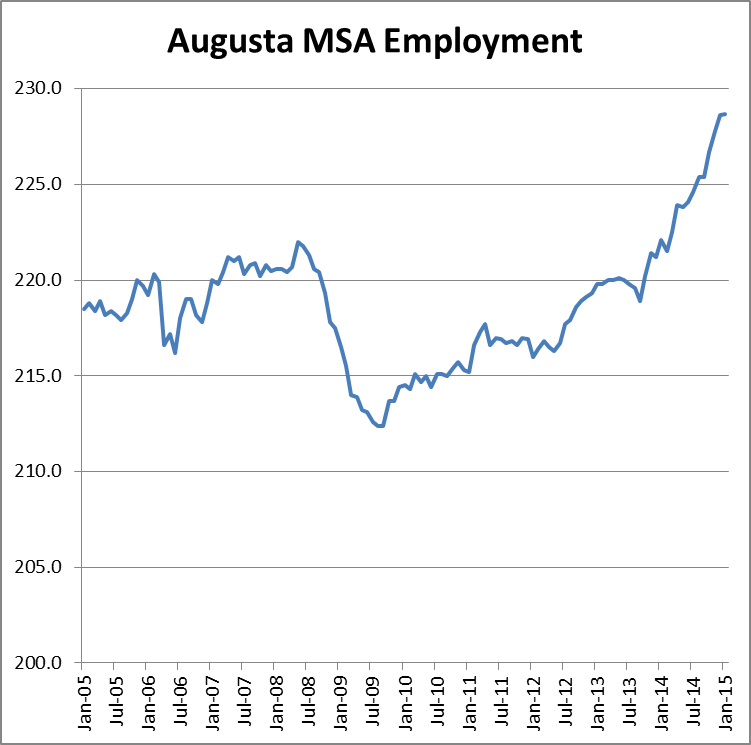 Employment remains strong with 228,700 people employed in the Augusta MSA in January. January 2015 represented the first month when the Augusta MSA included Lincoln County for employment purposes. 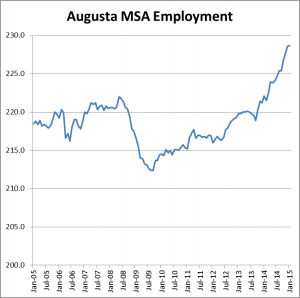 The Bureau of Labor Statistics has revised employment data for the Augusta MSA back to 2005 (see graph). The story, however, remains the same: the Augusta area continues to see continued economic growth. Recent employment grow has been seen in education and health services, financial activities, transportation and utilities, and leisure and hospitality. 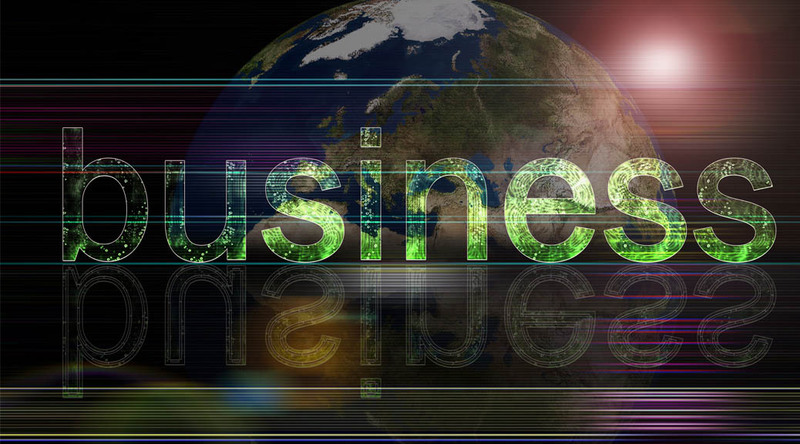 Simon Medcalfe is an Associate Professor of Finance in GRU’s Hull College of Business. He earned his doctoral degree from Lehigh University, and he received his master’s degree from the University of Leicester. 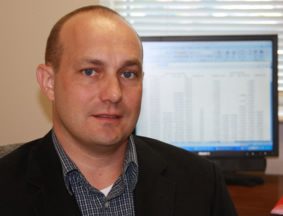 Medcalfe has authored numerous academic articles and is a former columnist for the The Augusta Chronicle’s “Your Business” section. Marks’ envelope contained the news that she would start her residency right here, which was her first choice. The Augusta native was thrilled. 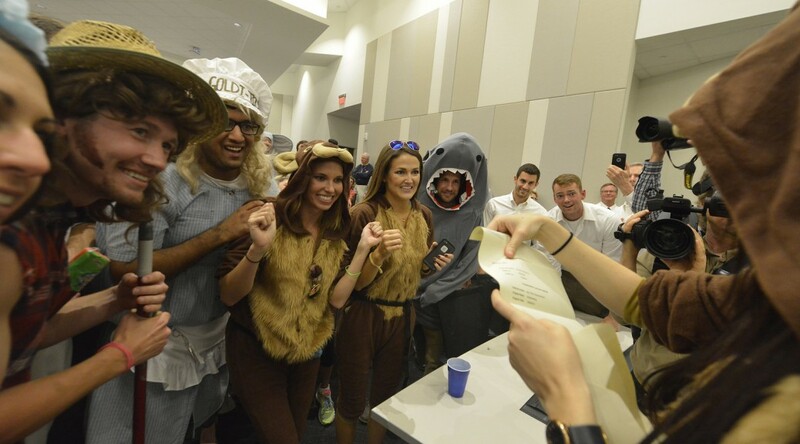 All across the nation, senior medical students opened similar envelops and found out where they would be receiving their postgraduate specialty training. In Athens, 39 students enrolled in the GRU/UGA Medical Partnership went through a comparable, though more reserved, ceremony. 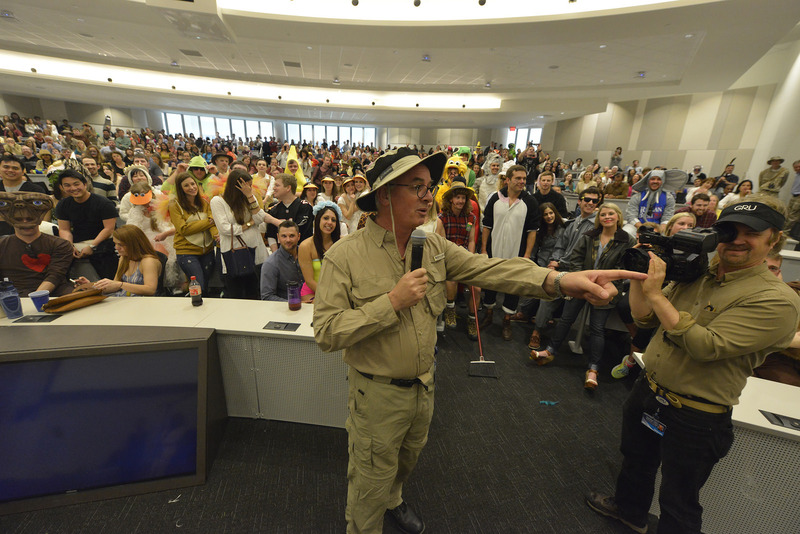 MCG’s theme, “Welcome to the Jungle,” drew enthusiastic participation from everyone, including Medical College of Georgia Dean Peter Buckley, who wore full khaki and looked ready to go on safari. According to the Association of American Medical Colleges, nearly 35,000 U.S. and international students applied for one of the more than 27,000 first-year residency positions offered in this year’s Main Residency Match. Here, this year’s class had an impressive 97.7 percent match rate, with students headed to programs in 35 states. Thirty percent will remain in Georgia for their first and second postgraduate year, with 20 percent remaining at MCG/GRHealth. They matched in 18 specialties, and 40 percent are pursuing primary care, including Chris Ellington, who got exactly what he wanted. After an agonizing week of waiting, his relief was obvious. 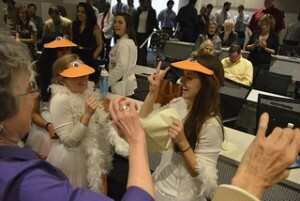 Lindsey Carter and Janelle McGill, who along with several other friends dressed up to form a gaggle of geese, got their first choices, too – Carter to Greenville, South Carolina, and McGill here in Augusta. “All of us (in the gaggle) either got a number one or a number two choice,” Carter said. Underlying the party atmosphere, however, was the fundamental significance of what was occurring. Relaxing with friends after the ceremony, Ellison seemed to agree. For the Match Day highlight video, click here. Last week, over 480 freshman and sophomore students gave poster presentations at the Center for Undergraduate Research and Scholarship (CURS) and INQR 1000 Academic Expo. 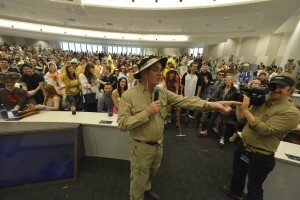 The theme for this year’s one-credit hour INQR 1000 class was “Food for Thought,” and different classes approached the theme in different ways. He said some of the best ideas students came up with occurred simply because they were talking with other students, which is one of the points behind the program. The class is so popular that Hauger has a couple of students who have returned to help out just to see what the new batch of students is doing. Because research suggests that students start college looking for answers rather than asking questions, the course directs students toward being active learners by teaching them how to identify and collect appropriate evidence, present results, formulate conclusions, and evaluate the importance of those conclusions. 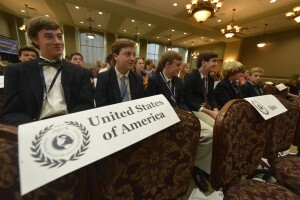 While there’s no guarantee that any of the students participating in GRU’s Model United Nations program will end up being elected president of the United States or voted in as secretary-general of the UN, at least they stand a chance, which is more than you can say for those who aren’t a part of the program. Next week, 6,000 of these future world leaders from over 50 countries will converge on New York City to participate in the National Model United Nations, and GRU’s group will be right in the thick of it. Run in joint partnership with the political science department and the study away program, the Model UN program is a three-credit class that runs the full 16-week semester and culminates with the trip to New York, where each program represents a particular member nation of the real UN. This year, GRU is representing Palestine and will have a 90-minute briefing with the Palestinian Permanent Observer Mission. Albert chooses – and gets – countries at the epicenter of world affairs. In 2012, GRU represented Iran. Once the students get to the conference, they have to remain in character throughout negotiations of a United Nations resolution. 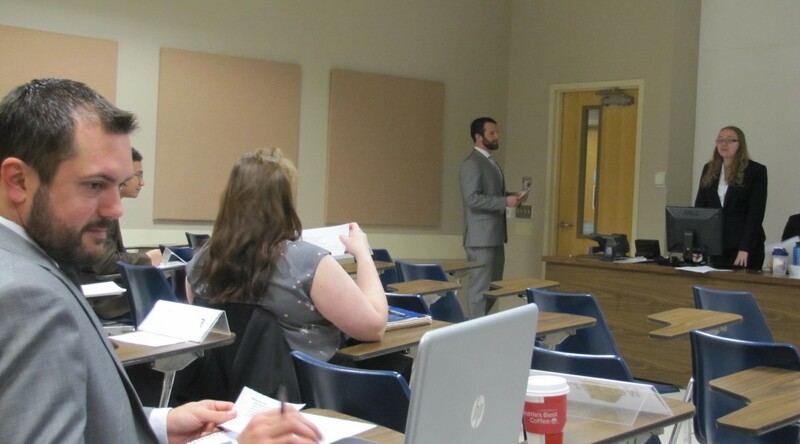 One of the class requirements is that students attend every class in full business attire, which helps promote a sense of solidarity among the participants while preparing them for the long days in New York. The strategy seems to work. GRU has racked up 17 international awards in four years, including a few best overall delegate awards, several position paper awards, and a regular appearance in the top three of participating programs. In October, GRU hosted its first middle school Model United Nations, creating a kind of feeder system Albert hopes will benefit both the program as well as the school. Participating at the college level is not cheap, however. Because the program is run through the study away program, the cost is $1,800, which covers the transportation to New York and six nights at a Times Square hotel, but is still very expensive, considering that some students choose to participate more than once. “Hopefully, in three or four years, the program can be a self-funding type of activity, which means I can really help all demographics of students,” Albert said. Because of that, Albert is hoping to put the money raised by putting on the middle school Model UN into a scholarship to make the opportunity more affordable to all students. Donations made out to the Center for Public Service: Foundation Account #29191 can be sent to Dr. Craig Albert, 2500 Walton Way, Department of Political Science, Augusta, GA, 30904. 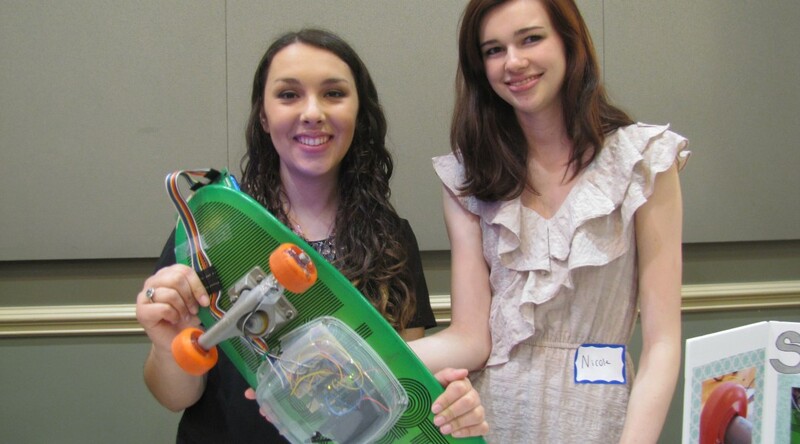 At the Georgia Collegiate Honors Council conference in Americus, Georgia, a few weeks ago, nine students from Georgia Regents University presented research in podium presentations, and two, Asma Daoudi and Brittney Laufer, won first prize in their categories. 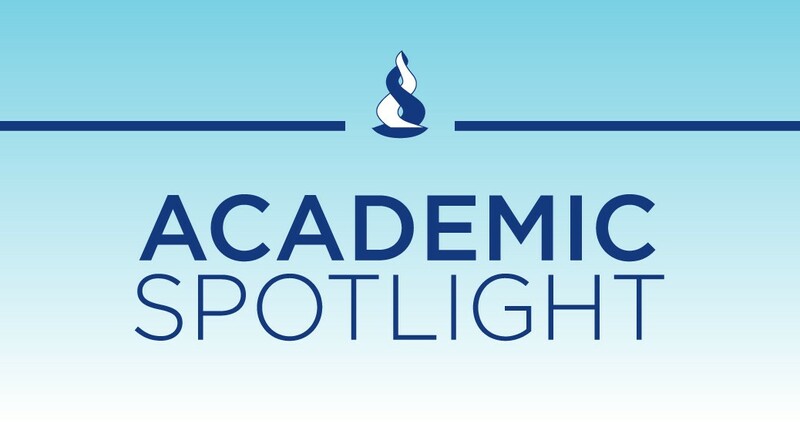 That means GRU Honors students won two of the three categories at a major state-level conference, which is a big boost for the growing program. 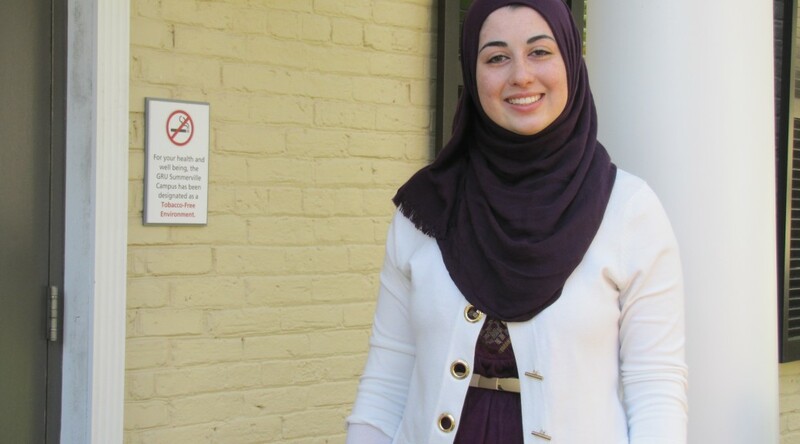 For Daoudi, who finished second overall at the Georgia Undergraduate Research Conference last semester, the win confirms that she’s headed down the right path. On Thursday, March 19, Daoudi and eight others will be attending the Southern Regionals, and she’s also applied to attend nationals in November. Daoudi was also elected Student Vice President for the state Honors Council and will help plan for the 2016 state conference, which will be held at the Summerville Campus next February. In a practical sense, “up here” is the Quad Wall building, which serves as the program’s office as well as a kind of clubhouse for the close-knit group of students, who will gather between classes to relax and often attend lectures and other presentations there. Honors students take Honors-designated core courses before moving on to interdisciplinary courses like Darwin and the Victorians, the course Sadenwasser, an English professor, is currently co-teaching with Dr. Donna Wear, a professor from the biology department. Usually around their junior year, students will start writing their honors thesis, something not every honors program requires. 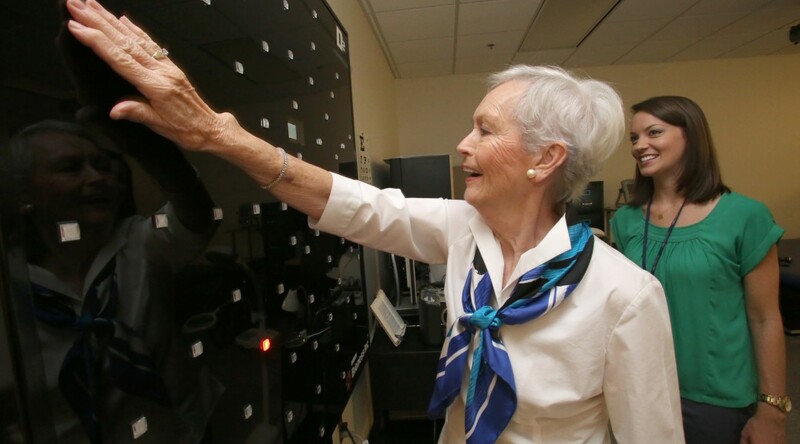 “I think to complete a project and see it all the way through to the end is really very strong preparation for them to go to medical school or graduate school or enter into a challenging career,” Sadenwasser said. Daoudi, who was born in Syria, seems to be leaning toward going to medical school after graduation. According to Dr. Wayne Lord, Associate Dean of Georgia Regents University’s College of Education, the newly created doctoral degree in educational innovation is generating a lot of attention. The Educational Innovation EdD is the first doctoral program in the College of Education and the university’s first doctoral program outside of health and medicine. Lord said they initially considered offering a PhD, but after consolidation, the focus shifted toward an EdD. Lord said that by focusing on real problems of practice, the EdD program will help groom the educational leaders of tomorrow to influence from within. Because the program will be asking local school districts for input about the problems they are facing while also working with them to develop solutions, some are calling this a consultancy approach, which is fine by Lord. The program is modeled after the strong program put together at Vanderbilt. Consequently, the program will follow a cohort approach, with the 12 to 15 students working together. The belief among those at GRU is that change in education is facilitated when people are able to collaborate. Not only will they be working in groups throughout the program, but their dissertation in practice will be a collaboration as well. Another plus, especially given the current financial pressures: The new program is kicking off without the addition of any new faculty. Offers of admission will go out in April, and classes will start in May.